It’s half a year until Talk Like a Pirate Day, but really, we need more than one excuse for finding our inner Pirates. Luckily, Mind’s Eye Games, the makers of Pirates of Gold Cove encourage players to be as salty as they want. Inspired by this, I am going to take this review out to sea. 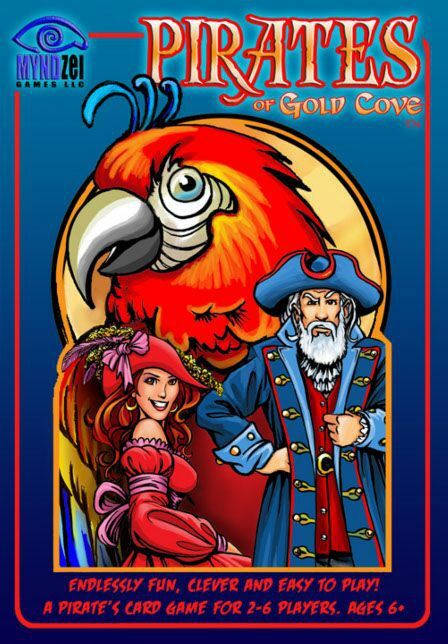 When ye crack open the chest for Pirates of Gold Cove, ye finds three things: a deck, a stash of gold and silver coins, and a page of rules. The deck be not the kind ye swab, but a deck of cards in four suits: green Swords, red Pirates, yellow Wheels and blue Anchors. The coins be the loot that the crew be fighting for. And the rules? Even Pirates need rules. Wit’ no rules, ye have anarchy, mutiny, and legs shot off at the knee. Ye needs a crew of three to seven for this. But if ye can’t pull together a full crew, there be a clause in the rules to play a duel. The goal of this here competition be to steal your crewmates’ cards by laying down a higher card. The landlubbers be calling this “taking a trick”. There be some cards ye want more’n others. All good pirates know that Spanish coins be “pieces of eight”, so if ye gets an eight in yer tricks, the Captain will pay ye a gold coin (5 points). Ye wants all the eights, unless ye also get Magistrate Burns (the 13 of Anchors). He loves pieces of eight more’n any pirate, and he’ll steal all yer eights. Ye also be looking for a chest an’ key (12 and 17 of Anchors) and two halves of a treasure map (12 of Pirates and 12 of Swords). Since yellow be the colour of gold, ye get paid one silver coin for each yellow Wheel card ye take (excepting the 8, o’course). Finally, if ye rescue the lovely Duchess Carmen (14 of Pirates), ye earns the Mystery Cache (5 cards hidden away at the start of the hand). There be one more card ye be looking for: Salty the Parrot, who be part of the Anchors, but he don’t have no number. If ye play the last card in a round, and that card be Salty, ye gets a gold coin (5 points) AND ye gets to choose who takes the trick. Now that ye know what ye be looking for, Avast, and listen as I tell ye the rules. Before anything else, ye must prepare the deck. Count who be part of the crew, and remove the cards with that number. If the crew be three, remove all the threes; if the crew be seven, remove the sevens. So simple, even the cabin boy could do it. Next, shuffle the deck and count out five cards; this be the Mystery Cache. Then, deal out cards to all the crew, until all the cards be handed out. Whichever pirate gets the Ship (the 17 of Swords) plays first, laying down that card. If the Ship be not found, the highest Sword plays first. In the direction of the clock, each pirate lays down one card of the same colour. If ye don’t have the right colour, any card will do. This be called “painting the ship”. When every pirate has played one card, this be one Round. The trick goes to the highest card in the colour that started the round. If the trick has at least three cards of that colour, the pirate be payed 1 silver coin immediately. The next pirate starts a round with any card, excepting that ye cannot start with a yellow Wheels card until the ship be painted once. When the last card is played, that be one Hand. Pirates score the points for the tricks they hold, and the holder of Duchess Carmen counts the points from the Mystery Cache cards too. Pirates be payed in order, from the highest score down. Next, count out a new Mystery Cache, deal a new Hand, and begin again. When do ye stop playing? When there be no more coins to give out! Every pirate counts their booty, and the winner be the one wit’ the biggest stack of coin. Seriously, this is a simple trick taking game for the whole family. If you are already familiar with traditional trick games like Spades or Hearts, it won’t take long to learn this version. If you are from exactly the wrong generation to know what “taking a trick” is, it may take a game or two to get the hang of it. The cards are colourful, the theme is fun, and the coins make keeping score more exciting. The only complaint I have is that the designated starting card is the highest valued card of its suit, meaning that whoever plays the first card automatically wins the first round. Some of the terminology is also a little counter-intuitive. We are used to having several hands making up one round, not the reverse. But these are Minor issues, not enough to ruin the fun. You can find Mind’s Eye Games online at myndzei.com or on Facebook at facebook.com/MYNDzeiGames. Thanks for the review. We’re glad you found fun playing the game. We appreciate the feedback about some of the terminology, especially from an experienced group of players. Technical writing of the game rules is always tough. Trick-taking game purists might find a couple of the variations add an undesirable amount of randomness to the game. We intended a fair amount of randomness in order to spread the pirate loot among all players. Keep in mind that each player in turn will get to play their highest card, somewhat mitigating the random placement of the highest green card for the first hand. I hope everyone appreciates your contribution to the hobby game community and the amount of effort it takes. Thank you!